Redken products are sold to us directly from the distributor. The brand offers a high end retail product made of quality ingredients and delivers excellent results for all hair types. The Redken product line is well-known around the globe and is very popular within the United States, featured in all major salons. 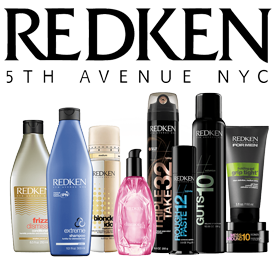 We carry a variety of Redken products, each with it's own specialized purpose. From shampoos & conditioners to nourish and restore the hair's natural PH to straightners, styling products and color - Redken products are professional quality and deliver truly amazing results. We use Redken products and they are also available for purchase at Salon Cambrai. View our photo gallery of beautiful hand painted nails. Appointments are available! Product makes perfect! Click here for our very latest product reviews and recommendations. Sign up or login to use our online booking system and schedule an appointment for hair or nails.